Welcome to Best for Bride's Clearance Department! Famous designer bridal gowns are now on sale starting from ONLY $99. Mori Lee, Alfred Angelo, Jasmine, Sophia Tolli, Alfred Sung, JAI Bridals, Madison, Cassidy Sarah, Fabulous formals and more. Clearance sale only till April 28, 2019. Please visit our boutique to see the gowns. If you are on a tight budget, however you still prefer to purchase a never worn new dress we invite you to look at our Clearance Department where you can find a great bargain at very attractive and extremely low prices. A huge selection of bridal gowns, bridesmaids dresses, mother of the groom and mother of the bride dresses, prom dresses, evening dresses, special occasion gowns and cocktail dresses are reduced up to 80% of the original purchase price! All the gowns at Best for Bride Clearance Department are new and never worn and as we take a good care of our dresses all of them are in the excellent clean condition. At Best for Bride Clearance Department you can find a great deal on beautiful high quality wedding and evening dresses of such popular bridal designers as Aglaia, Alex Hanson, Amber Nicole, Bridal Originals, J Valentina Bridal, Nadine, Party Time, Silhouettes and many others. More than 150 different styles and sizes are available in stock at our Clearance Department. Although we update this page often, we can not advertise all of them online, as the dresses are sold quickly and new dresses are added to the clearance all the time. In order to see all the selection available you are welcome to visit Best for Bride bridal shop located in Etobicoke/Mississauga, Hamilton or Barrie. Please note that the sizes of the dresses may vary according to the manufacturer company. For example, if the bridal gown is in size 8, actually it may fit perfect a bride in size 6 or size 10; MOB dress in size 16 may look gorgeous on a mother of the bride in size 14 or size 18; brides maid dress in size 12 may be suitable for a bridesmaid in size 10 or size 14; or prom dress in size 2 may look fabulous on a girl in size 0 or size 4. And how can you know if the particular dress will fit you? Actually, only by trying on the dress you can know how it fits, so don't miss this opportunity and come to Best for Bride Bridal & Evening Wear store at your convenient time to try on the dresses! 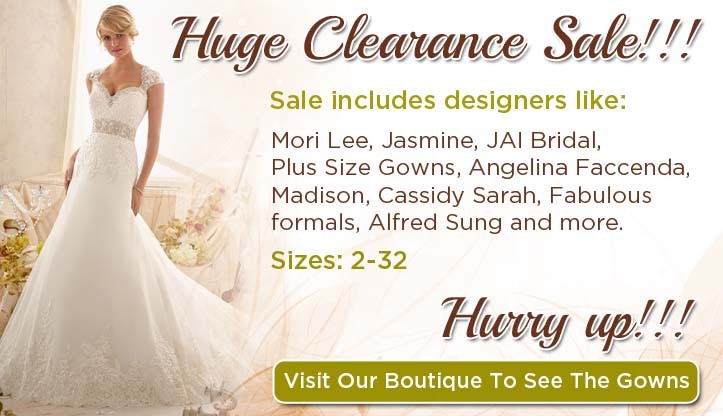 Dresses at Best for Bride's Clearance Department are sold on a first-come, first-sold basis! Discover a stunning range of unbelievably cheap wedding dresses from leading designer collections at the Best for Bride clearance and sale section. Visit us at our bridal shopping outlets in Barrie, Toronto, Hamilton and Etobicoke to find an amazing variety of wedding dresses on sale at prices as low as $99. Maintained in excellent condition, these discount wedding dresses are available in all sizes and styles, so there is plenty of choice for everyone. Why spend a huge chunk of your dress budget on the latest wedding dress when you can save with off the rack wedding dresses at our store! Our wedding dress clearance section features dresses from previous seasons and an exquisite range of never-worn collections. This allows you to find a brand new gown for your special day at an unbeatable price! For affordable wedding dresses in Toronto, visit the Best for Bride store and make your pick. Enjoy the same value for money with unique discount offers for cheap bride dresses at our bridal stores in Barrie and Etobicoke. While you score a gorgeous discount wedding dress at our clearance section, don't forget the rest of your bridal party! Our clearance section also carries cheap bridesmaid dresses and fantastic mother of the bride dresses at our Toronto outlet and other Best for Bride stores. What are you waiting for? Be the proud owner of a cheap wedding dress in Canada by booking your appointment to shop at our clearance and discount section at Best for Bride today!